This unique recording is available on CD. Up to 16 tracks recorded by sound and film engineer Mike Valentine using 50 year old vintage microphones and a 24bit professional Nagra recorder as well as a Studer tape machine. 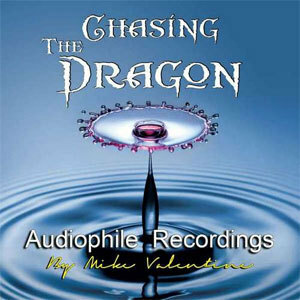 Chasing the Dragon is the title that producer/engineer Mike Valentine has given to a disc of audiophile recordings he has made using vintage valve mics arranged in the classic Decca Tree configuration and a Nagra VI six-channel location recorder ($9900). 24-bit/96kHz Nagra, which sounded stunning, by far the best sound at the show. This is clearly a superb recording, and the Nagra isn't too shoddy either. Chasing the Dragon contains 15 tracks of largely classical material with some interesting contrasts. For instance, the same cello piece is recorded in a church as well as outside it. In creating this audiophile demonstration CD, producer Mike Valentine has combined 50 year old valve microphones with a high resolution digital recorder, capturing a variety of acoustic tracks which should take you and your Hi-Fi system on an interesting journey! Each page of the booklet is devoted to a track, so that you may see how the recording was made. At last year's NAS show, reviewer Jason Kennedy reported that the CD was "...by far the best sound of the show." This CD contains selections from composers and musicians that include Bach, Copland, Mozart, Ellington, and more. This Audiophile Demonstration CD contains selections from composers and musicians that include Bach, Copland, Mozart, Ellington, and more! In the early 1950's Decca engineers were experimenting with stereo recording techniques. Using 3 omni directional Neumann M50 microphones, their system became know as the "Decca Tree". The same "Decca Tree" has been used here to capture Vivaldi's wonderful composition. This approach also re-creates the warmth of the monastery were it was recorded in Venice. Chelmsford Cathedral in England has a wonderful organ, which in this recording is combined with their own choir. Just two M50 omni directional mics were used. Known as a "spaced pair" they are really successful at capturing the atmosphere of the church. The choir were placed in front of the organ and recorded at night to reduce traffic noise. In an English church, 3 M50's were set up to record cellist Justin Pearson performing Bach's Prelude. Between the mic, a Jecklin Disc was placed. This increased the separation of the spaced pair. The acoustics of the church are wonderful! The same microphones, performer, cello and the same piece of music... but this time recorded outside in the graveyard! How important are acoustics? What would it sound like to be able to remove the church from the last recording? Compare the tracks to hear for yourself the results of this interesting experiment! Invented by Alan Blumlein in the 1930's this recording of a harp uses his "crossed pair" of figure 8 microphones. They are placed one on top of the other and stereo positioning can be accurately captured. The microphones are just as sensitive to the rear as to the front therefore a really good all round acoustic space should be used. Here is Widor's war horse, performed in a large church in central London. Recorded during the day so you will hear some traffic noise! The organs air pump was also quite noisy however, the musical presentation of this great piece shines through! Two omni directional M50s with a lambs wool disc were placed in front of the pipes. A group of amateur brass musicians have come together to form East London Brass. They have won several prizes and here they have been recorded using the "Decca Tree" along with 2 spot mics on the percussion to capture their performance of this great piece. This simple recording technique also captures the excitement of this live performance. The young award winning soprano Daisy Brown is recorded here in a large church performing this wonderful piece. The church organ provides a wonderful accompaniment to this piece. There are many ways to record a piano. Here, a "spaced pair" of Neumann U47s have been used to capture the concert hall and another U47 as a single "spot mic" on the piano. These valve mics are over 50 years old in design. However, they seem to successfully capture the young Turkish student Suzan Senol's youthful and vibrant performance. Unlike the purity of the concert hall with its natural acoustic space, the piano here in the recording studio was captured with 6 microphones. Two on the keys, two on the strings and two set back within the studio. Echo was then added electronically. This makes an interesting comparison to Piano Concert Hall: Ginastera's Dazas Argentinas. Mouret's Rondeau is performed here by 5 musicians which were spread uniformly across the stage. From left to right are a trumpet, french horn, bass trombone, trombone and cornet. In a recording studio each musician would probably have had their own microphone. Here the ensemble were captured in a real acoustic space using the "Decca Tree". Turkish guitar student Sinan Kursun performs Bach's Lute Suite in the ASSMM Concert Hall in Izmir Turkey. Two U47s were placed at the front of the stage to capture the ambience and another placed in front of the guitar. As the mics were recorded separately, it gave the opportunity of balancing the instrument within the acoustic space. The "Decca Tree" was used as well as 2 mics added to the left and right at the front known as "out-riggers". A spot mic was also added for the woodwinds. Piano, bass, trumpet and drums provide the core of jazz bands all over the world. Recorded in a small club in Izmir Turkey, Duke Ellington's timeless piece provides all the musicians with an opportunity to perform their individual solos. Take a variety of cymbals, bells and gongs and hand them from a frame made of boat oars. Now add Turkish percussionist Emre Kartari to the ingredients and play! From the quietist bell to the loudest gong, this piece should really push the abilities of your system. Watch your replay level... although it starts quietly, it really gets loud! the "Decca Tree" has been used to record Sarasate's ravishing Tarantella. To reduce reflections form the windows in this venetian monastery, 6 mattresses have been added. Mush to the amusement of the musicians! The "Decca Tree" is wonderful at capturing the should of the music and just as importantly, the acoustic space.